Mylor boat hire is in the perfect location to launch your exploration of the beautiful Carrick Roads, an area of water which extends from the entrance of Falmouth Bay, all the way up the river Fal to Truro. 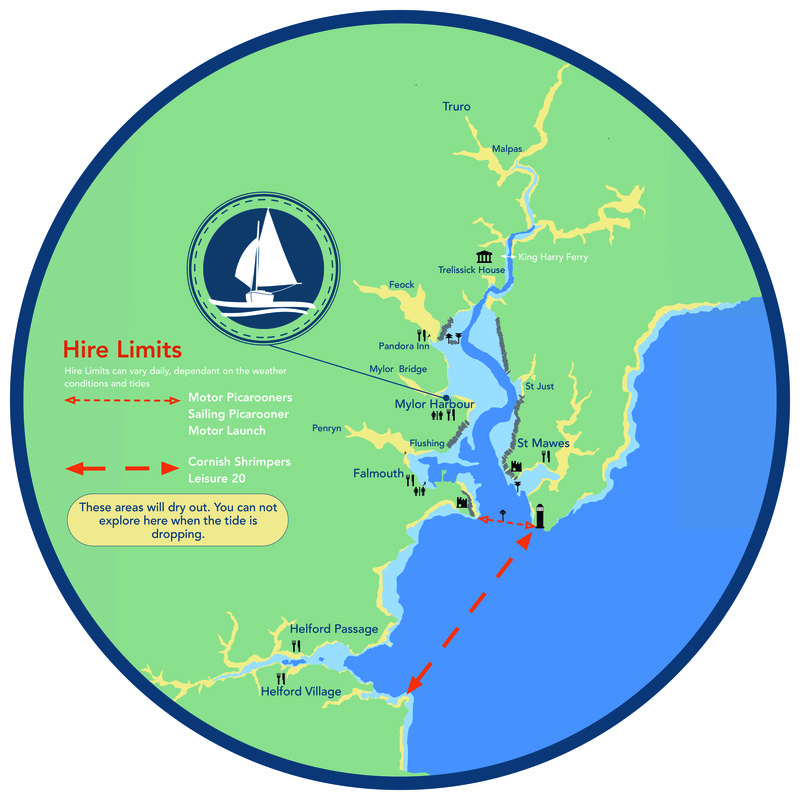 For those hiring our larger sailing boats, the hire area limit increases to as far as the Helford. Our motor boats can take you around to Falmouth in around forty minutes or so, where you will usually be able to see plenty of impressive ships and boats, stop off on a visitor pontoon (for a small fee) to explore the historic town, or grab something to eat in one of the many pubs and restaurants it offers. Trellissick House, an impressive National Trust property with stunning gardens and grounds, is located overlooking the mouth of the river Fal around a forty minute journey away. It has a visitor pontoon allowing you to arrive by water to enjoy a look around the grounds or a visit to the tea room (bring your National Trust cards for a walk through the gardens). The pretty fishing village of St Mawes is less than an hour away, and again it offers visitor pontoons to allow you to moor your boat and stop off to explore or enjoy some fish and chips. There is a small charge for using their pontoon, and they are only accessible at certain tide heights on which we can advise on your arrival or earlier call. There are numerous stunning beaches to anchor off dotted around the bay, and the scenery wherever you decide to go is lovely. If you just want to stay in the boat and look around, there is a huge amount to see, from the two Henry VIII castles on Pendennis Point and St Mawes, which once protected the Carrick Roads from the Spanish Armada, to the plentiful wildlife. Herons, little egrets, buzzards and cormorants abound, with the chance of spotting a kingfisher and strangely for a brief period in 2017, a somewhat out of place pelican. You may well see the head of a curious seal popping out of the water, or a group of them soaking up the sun on Black Rock at a low tide. If you’re very lucky, you may be joined by a pod of dolphins or porpoises. Many creeks meander their way off the main body of water, and as longs the tide is favourable, lead to pretty hidden villages and peaceful anchorages you will most likely have all to yourself. Our Shrimpers and Leisure 20 are able to travel further afield, beyond the beaches in Falmouth bay, and along the coast around to the Helford river and all it offers in terms of scenery, beaches, pubs and places of historical interest. Full Admiralty charts for the entire cruising area are supplied.